Michael Walton and the Michael Walton Foundation would like to extend a very special thank you to everyone who participated, extended a helping hand and donated to the First Annual Michael Walton Foundation Weekend. This 3 day event inspired and had a huge impact on the lives of teens in Washington, DC and Prince Georges County, Maryland. Thursday April 2, 2009 kicked off the 3 day weekend with two school visits to Flowers Senior High School and Wise Senior High School. Celebrities and local officials joining Michael with his Speak Out To Reach Out included DJ Heat (DJ WPGC), Queen Aishah (Comedian), DeAngelo Redman (Making the Band - Bad Boy Recording Artist), Marilyn Bland (Presenting Michael with the Proclamation of Michael Walton Day by Prince Georges City Council), Yolanda Mackle (Ms. Belleza Latina 2009), DJ Fillup Banks, Darnerian McCants (recording artist and former NFL Player) and Black Boo (Mambo Sauce). Friday April 3, 2009 continued with the First Annual Michael Walton Golf Tournament inclusive of a formal luncheon and awards ceremony. Although the weather was quite rainy, the spirits and sportsmanship among those who gave their time brought sunshine and happiness to the cause and foundation overall. Some of the players and those who donated their time included Shaun Walker (Radio One ) Mark Gray (WOL AM Radio Personality) Mark Tillman (former Georgetown Basketball star), Derek Greenfield (MWF), Angela Roisten (MWF) and Kevin Roisten. Saturday April 4, 2009 was a full day of events kicking off with the sports clinic at Coolidge High School in NW, Washington, DC. Michael Walton and Darnerien McCants (former NFL Player) provided skills training and strength building exercises and techniques to 50 students. Snacks and PowerAde were provided to all of the students, staff and athletes. The afternoon continued with the First Annual Michael Walton Teen Summit. With the hit BET show “Teen Summit” from the 1990’s in mind, Michael gathered a group of individuals to speak openly and directly with a panel of teens about issues which affect them. Panel members included Micheline Bowman (HOST - FOX 5), Michael Walton, Wil "Onix" Lash (VH1 – I Love NY), DJ Flava (DJ WKYS, Social Worker), Jazmine Alexis (Miss Teen DC), Derek Greenfield (Author, Motivational Speaker), Heather Drake (Photographer), Bossman (Rapper/MySpace Recording Artist), Daunett Samuda (Howard University Hospital Nurse/HIV/AIDS specialist), and Irwin Royster (Director for Outreach Services, Planned Parenthood of Metropolitan Wash, DC). Shanita Williams was awarded the 1st first ever Carla Willis-Morgan Scholarship which will assist Shanita in the purchase of her books and supplies for college. At the end of the summit, Congresswoman Marilyn Bland was honored with a special award for all of her support of the teens and the Michael Walton Foundation and their efforts. Myvoicedc.com, 100 Black Men, YMCA, PowerAde, WOL- AM, MWF Youth Squad, FOX 5, DPR, D.C. Department of Parks of Recreation, American Lung Association of D.C., Sure Shot Photography, Bonita Bolden (HUH Cares), Trena Taylor, Wardine Walton, Neosho Ponder, Friendship Collegiate Academy students, Charles Young , Linda Aarons, Jackie Hill (Dr. Henry Wise High School administrator), Lizette Corro, Demetria Robinson, Derek Greenfield, Howard University track & field. Monique Williams, Tamiko Thomas, Neeta Wooten , Nafeesa Saboor, Glen Hodge and Ramona Barber. 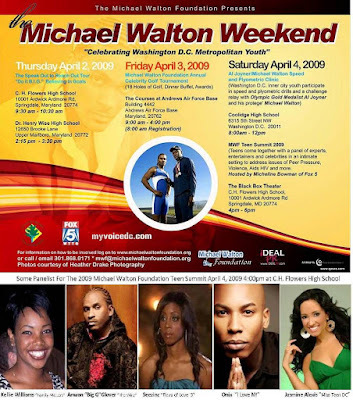 Michael Walton, along with his foundation, will present the First Annual Teen Summit and Foundation Weekend of events April 2-4, 2009 in the Washington, DC Metropolitan Area. The Teen Summit topics will include Violence, HIV/AIDS, Peer Pressure and Smoking with special celebrity guest panelist. Washington, DC (IDEAL PR) March 31, 2009 -- Michael Walton along with his foundation will present the First Annual Teen Summit and Foundation Weekend of events. Teen Summit topics will include Violence, HIV/AIDS, Peer Pressure and Smoking. Special guest panelist Include: Kellie Williams (Family Matters), Anwan “Big G” Glover (HBO “The Wire”), Onix (VH1 “I Love NY” & “I Love Money 2”), Autumn Joi (“Seezinz” of Flavor of Love 3), Damond Gordon (Director and former Posse Member of BET’s Teen Summit), Jasmine Alexis (Miss Teen DC 2008), Mambo Sauce (Hip Hop/Go Go Group), and other distinguished panel guest members. Michael Walton is more than just an athlete; he is a pioneer making a difference in the Washington DC area communities. On Saturday April 4, 2009 Michael will present his first annual MW Foundation Teen Summit to address issues and concerns that affect our youth and teens today. Inspired by the once popular TV Show on BET “Teen Summit” a few of the show’s hosts/posse members will join Michael and share their voice to inspire and encourage. The Teen Summit will honor the efforts of Prince Georges County City Council Chair Marilynn Bland. Why does Michael continue to tirelessly add his voice and give his time? "When Michael Walton spoke to us it left me speechless. He told us a story about a crossroads in his life in which is mother gave him inspiration that led to him accomplishing great things for years to come. That day when I went home I applied myself more than ever. I picked up a book, started reading and studying. I learned so much from the assembly. 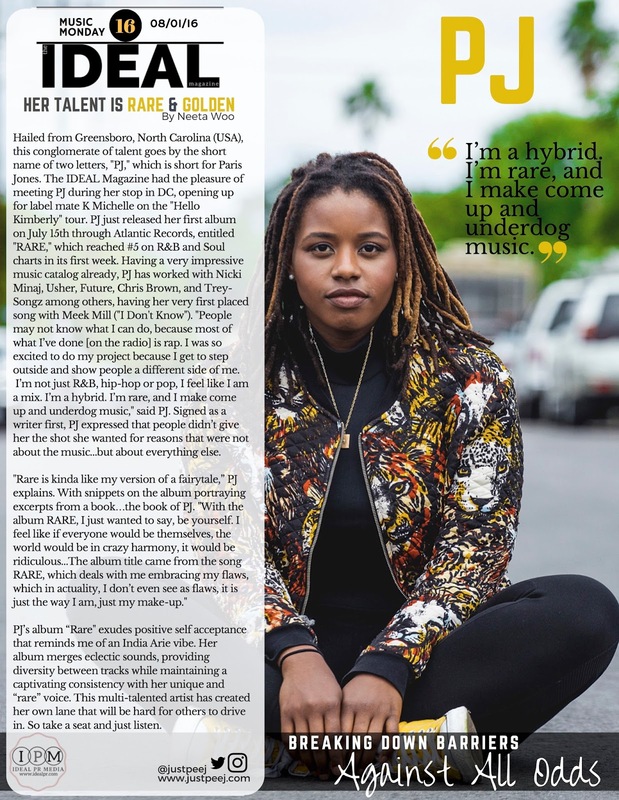 If you have a dream go for it and don't let anyone rob you of that dream," said a 10th Grade Student of Dr. Henry Wise High School in Prince George's County, Maryland. Please join Michael Walton and the other panel members for an amazing day of encouragement, inspiration and change. One by one we can make a difference, but together we can create change. In addition to the Teen Summit, The Michael Walton Foundation has 3 days filled with wonderful opportunities to involve and benefit the youth of Washington, DC and PG County Maryland. Below is the list of events. The Speak Out to Reach Out Tour "Do it B.I.G." Believing In Goals: This one hour, entertaining, high energy in school affair features athletes and entertainment figures giving students real life examples of success!